← Pat Pat Pets HD: Swords and Soldiers Clone? Being on the list of “The Best Games You Never Played” in the iPad App Store can only mean good things for Shake Spears HD. This unique little game focuses on the lost art of jousting, last seen perhaps, in A Knight’s Tale. 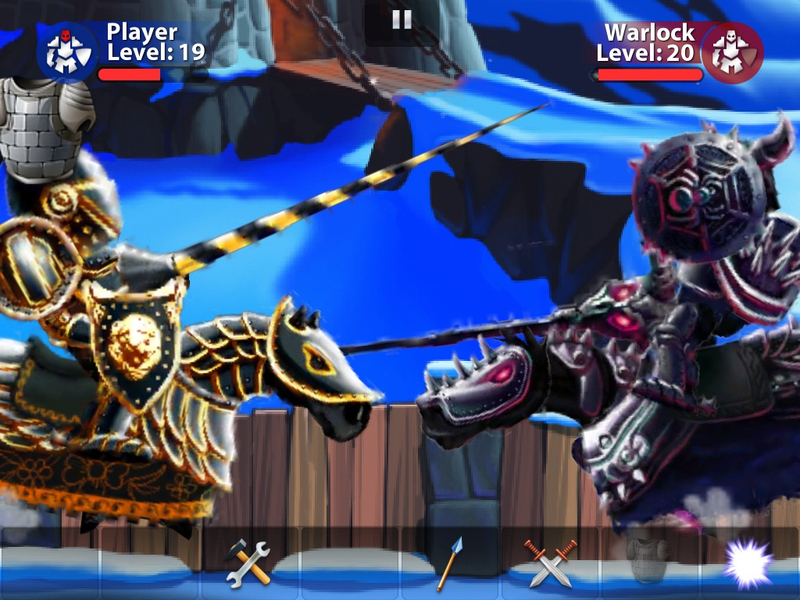 Simulating a tournament style environment, you face off with a variety of AI opponents and charge at each other, scoring points on critical hits and winning when you knock your opponent off his horse. As the game progresses,you will find that you need to buy certain special power-ups which can be used to your advantage during critical moments, and this is where the fun comes in. Apart from choosing which armor, and weapons, you also need some quick thinking to know which power-ups are effective to use not only to protect yourself from your opponent, and which ones he will likely use against you. Thus, prior to and during battle, you have to juggle between attacking and neutralizing your enemy. Since the charge only takes a matter of seconds before it’s over, you only have a tiny window of opportunity to act decisively. The range of available weapons and armor upgrades is quite extensive. Even more interesting are the different power-ups you can use, such as turning into a “ghost” where the lance simply passes through you. When you and your opponent are evenly matched, it’s interesting to see how you anticipate each other’s moves. I hoe that the developers consider adding online multiplayer, which would definitely make things a lot more interesting and extend the game’s replay value. The game is oddly exciting because every little thing you do counts, There is no game quite like Shake Spears HD on the App Store, and once you start playing, it’s difficult to put it down.